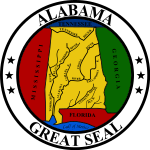 Alabama is a state in the southeastern region of the United States. It is bordered by Tennessee to the north, Georgia to the east, Florida and the Gulf of Mexico to the south, and Mississippi to the west. Alabama is the 30th-most extensive and the 24th-most populous of the U.S. states. At 1,300 miles , Alabama has one of the nation's longest navigable inland waterways. 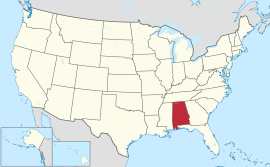 Alabama (/ˌæləˈbæmə/) is a state in the southeastern region of the United States. It is bordered by Tennessee to the north, Georgia to the east, Florida and the Gulf of Mexico to the south, and Mississippi to the west. Alabama is the 30th-most extensive and the 24th-most populous of the U.S. states. At 1,300 miles (2,100 km), Alabama has one of the nation's longest navigable inland waterways. From the American Civil War until World War II, Alabama, like many states in the southern U.S., suffered economic hardship, in part because of continued dependence on agriculture. Despite the growth of major industries and urban centers, white rural interests dominated the state legislature from 1901 to the 1960s, as it did not regularly reapportion the legislature from 1901 to 1961; urban interests and African Americans were markedly under-represented. African Americans and poor whites were essentially disenfranchised altogether by the state constitution of 1901, a status that continued into the mid-1960s before being alleviated by federal legislation. Exclusion of minorities continued under at-large voting systems in most counties; some changes were made through a series of omnibus court cases in the late 1980s to establish different electoral systems. Following World War II, Alabama experienced growth as the state's economy changed from one primarily based on agriculture to one with diversified interests. The power of the Solid South in Congress gained the establishment or expansion of multiple United States Armed Forces installations, which helped bridge the gap between an agricultural and industrial economy during the mid-20th century. The state economy in the 21st century is based on management, automotive, finance, manufacturing, aerospace, mineral extraction, healthcare, education, retail, and technology. Alabama is nicknamed the Yellowhammer State, after the state bird. 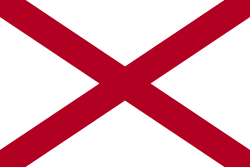 Alabama is also known as the "Heart of Dixie" and the Cotton State. The state tree is the longleaf pine, and the state flower is the camellia. Alabama's capital is Montgomery. The largest city by population is Birmingham, which has long been the most industrialized city, and largest city by land area is Huntsville. The oldest city is Mobile, founded by French colonists in 1702 as the capital of French Louisiana.